The Bloodstained Men & Their Friends hasn't added a story. Please support the GREAT NORTHWEST CIRCUMCISION CRISIS PROTESTS, our upcoming 15-day tour that will begin in Bellingham, WA and end in Seattle, WA in July 2016, covering many Northwest US cities in between...Missoula, Boise and Portland to name a few. We can't do it without your help. 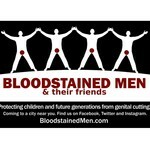 The Bloodstained Men rely on help from the community to continue the very important work of spreading the message that the men of this country need the same protection from genital mutilation that women are already afforded. Be a part of the most important human rights movements of our time by donating any amount you can afford. And as always, everyone is invited and encouraged to join us in the streets. The Bloodstained Men & Their Friends hasn't posted any updates yet. The Bloodstained Men & Their Friends is managing the funds for this campaign. The Bloodstained Men & Their Friends is a verified organization.